Providing the best living environment for your finch birds is difficult, especially if you don’t have the time to look for a cage yourself. However, Dr. Fox is here to help you out and offer you some great alternatives. 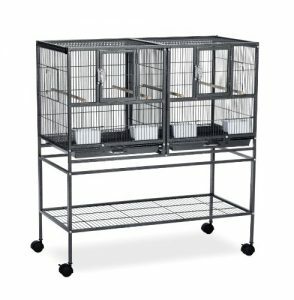 So, after going through numerous product reviews, Dr. Fox has concluded that a reliable cage to fit your finches is the Prevue Pet Products Hendryx. It is designed to house multiple birds and features two large front doors to allow easy access to the interior. In addition, the product provides 2 plastic cups for food and 4 comfortable wood perches. If this cage is not available, you could consider the Prevue Pet Products Hampton as a great alternative. The first thing you will probably notice when looking at this cage is its large size that allows birds of different sizes to stretch their wings and feel comfortable inside. The overall design of this model is attractive and practical. Its sturdy metal frame makes it durable, and because it is partially made of plastic, it is lightweight and easy to move around. You will also love the presence of the two large doors that let you get inside with ease for cleaning. The perches get dirty easily, and they tend to be a pain to clean. 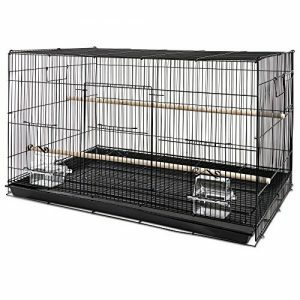 A large cage that will make your pet finch happy and comfortable. This divider model can be an excellent choice for people with multiple pet birds. There is nothing left out in the design of this particular model, as all the necessary items are provided, such as small cups for water and food, wooden perches, and other extras. The stand comes with wheels so moving the cage around is a breeze. The tray below can be used to store food for your pet birds and other supplies that you need on hand. At least one reviewer mentions that the stand is quite low. A divider model that comes equipped with many useful extras for owners. 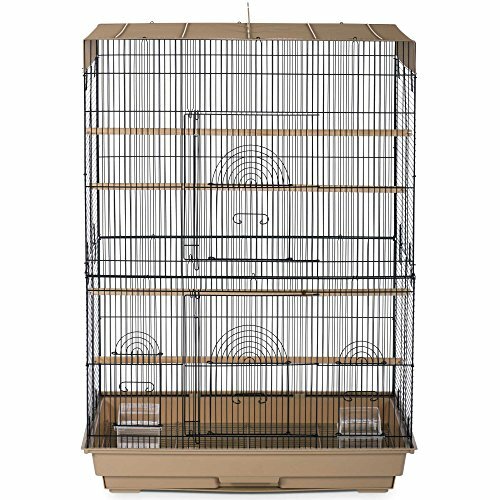 This cage comes with a rectangular base, and it provides finches and other small birds with plenty of room to walk and exercise. There is also a large door that you will use when cleaning the cage, petting the birds, or introducing food and toys inside. On one side, there is also a window that can be used for easy access by the pet bird. The bottom tray is detachable and helps with cleaning. Dishes and wooden perches are provided. You will have to use zip ties to secure the cage, buyers say. 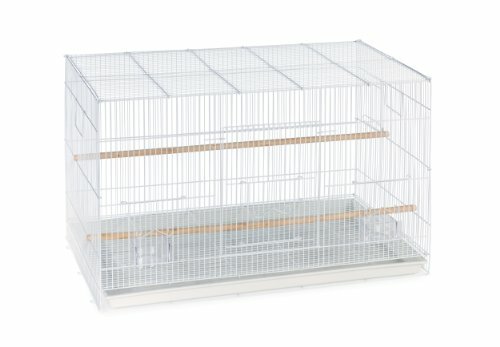 A rectangular-base cage that your finch will love because of its size. This product is available in three different colors and is specifically designed to house multiple species of birds, including finches. The cage’s large dimensions will provide plenty of room for your pets to sleep, eat, and play. The item is made of plastic with a sturdy metal frame for safe transportation. It features two large front doors to allow easy access for your birds. Thanks to that you can also clean the cage faster, add more toys or pet your birds. The product is also delivered with two plastic cups suitable for water and food, as well as four wood perches to provide comfortable sitting for your finches. In addition, the horizontal and vertical bars will help you attach feeders or snacks and treats in just a matter of seconds. Most of the customers who purchased the cage were impressed with its dimensions, claiming there is plenty of room for birds to play alone or with their toys. It is also lightweight and easy to assemble. This divided breeder cage provides plenty of room for your finches or other species of small birds. The product comes in a sturdy and high-quality iron construction with convenient features and accessories such as a divider, iron bars, large doors for easy access, and a stand. Thanks to the attached wheels, this double cage can be easily transported from one place to another. Moreover, the underneath tray is large and strong enough to stock your bird’s favorite toys, foods, and snacks. The item is delivered with four plastic cups for food or water, as well as four wood perches to provide comfortable sitting and sleeping for your birds. The bottom parts of the cages are easily detachable to allow convenient washing and cleaning using mild detergents and lukewarm water. The vast majority of customers who ordered this product were pleased with its heavy-duty design and long-lasting top coating that resists against corrosion and harsh weather conditions. 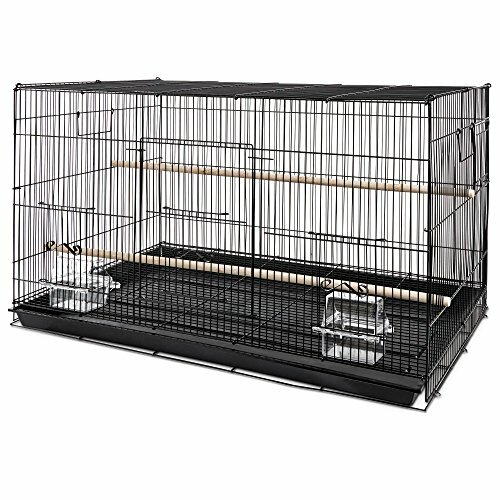 This large cage is extremely comfortable for small birds such as finches. They will have enough space to play, sleep, and walk due to the large rectangular base. The sturdy iron construction ensures your cage is safely transported and stored. The item features one large door at the front and a small window on the side to ensure easy access for your birds. The door is big enough to help you get your hands inside and add toys, food or simply pet your finches. The cage comes with a detachable bottom tray that can be washed with warm water and mild cleaning products to ensure a healthy, hygienic, and safe environment for your birds. In addition, when purchasing this product, you’ll also receive two 30-inch long perches and two covered dishes. The dishes are perfect for storing snacks, treats, food or water supplies while the wood perches will provide support and a rest space for your birds. This beautiful white cage will make the perfect decor for your room and a great home for your pet birds. It is specifically designed to encourage and support exercises and physical activities that will prevent your birds from gaining weight. 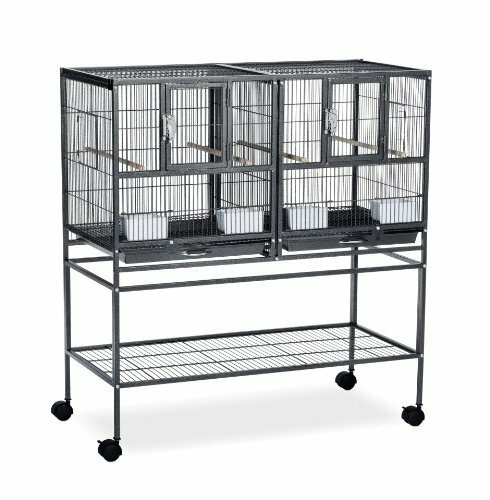 It can be easily stacked with other flight cages to keep all your pets in the same place. The item features a sturdy and long-lasting iron construction with a large front door. This will offer easy access for your birds. The item is delivered with two plastic storage cups for water or food, as well as two long perches made of wood. The bottom tray is detachable to help you clean the cage as often as you want and provide a hygienic and healthy home for your pet finches. 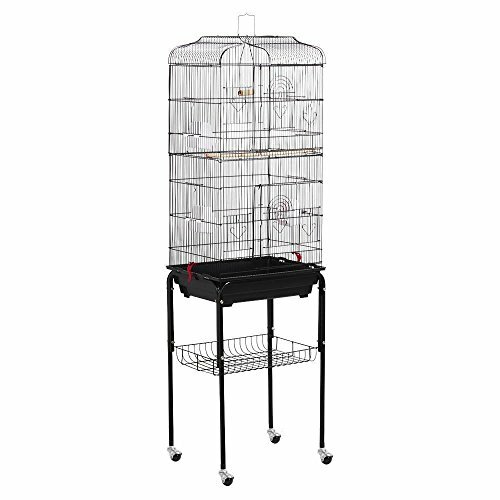 According to customers, the cage is mainly suitable for finches and canaries as these birds need to constantly stretch their wings, hence the need for larger spaces. 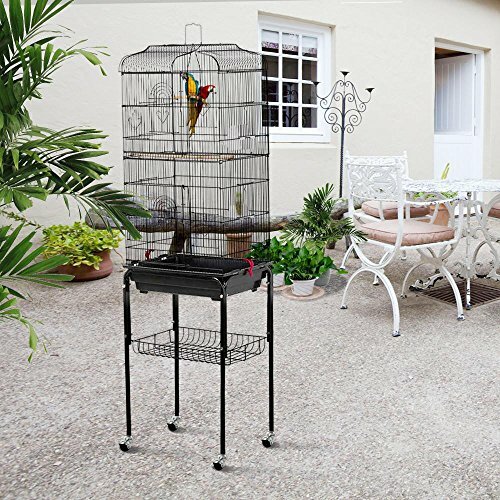 This tall cage is perfect for birds that need plenty of space to stretch their wings and fly. It makes a great home for numerous bird species, including finches. The item is made of sturdy iron wire and features a plastic tray. The total weight of the cage is nearly 17 pounds, but, thanks to the attached wheels, you’ll be able to easily carry it with you and place it wherever you want. The product is delivered with two wood perches of different heights and free feeders. You can access the interior of the cage through two different doors so it will be easy to pet your birds or change their food and water supplies. The large plastic detachable tray at the bottom can be cleaned using warm water and mild detergents. We suggest you do this regularly to ensure a safe and clean home for your pets. The cage is also delivered with a storage tray made of iron where you can deposit foods, snacks or toys. Finding the best finch cage is not an easy task, especially with so many products available for sale nowadays. 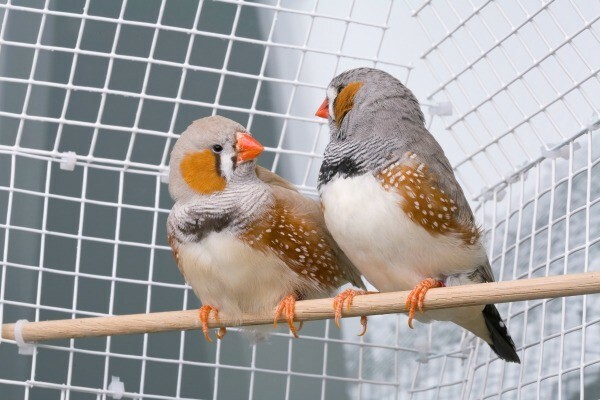 However, the following buying guide aims to help you identify the most valuable features so you can purchase the best cage for finches. The shape of the cage is extremely important if you want to house stress-free birds. Some owners decided to avoid buying round or dome-shaped cages as they might not be psychologically good for the birds, according to new studies. However, if you are looking for a cheap finch cage to host your little bird only for a while, the round ones could prove a hustle-free temporary solution. The most welcoming cages for birds are the long ones because they provide more space for these pets to stretch their wings and even walk a little bit. On the other hand, tall cages are mainly designed for bigger birds such as parrots because they’ll have enough room to climb and exercise without feeling trapped. A good finch cage should be made of strong and reliable materials. Reinforced steel or iron are the main types of materials used and you should avoid plastic if you don’t want a flimsy design that could allow your birds to easily escape. Nevertheless, a plastic tray on the bottom of the cage is a good option if you’re looking for a hustle-free cleaning solution. These trays can be detached from the frame of the cage and washed using warm water and mild detergents. Keep in mind that clean and welcoming bird houses are mandatory for happy finches. You should also check the size of the cage. Getting a large cage is our suggestion if you want your pets to be happy and active, especially if you also want to place one of the top-quality baths for birds inside as well. However, housing just one finch in a big cage could be a mistake as these birds prefer company and might feel alone with too much space and no one to share it with. 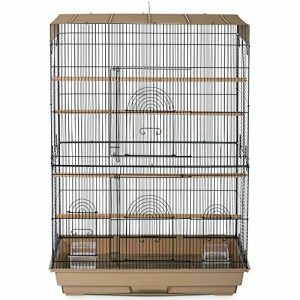 If you have doubts about the size of the cage for your small birds, we suggest you check online for some finch cages reviews and see what other customers have used for their own pets. You might also be interested in getting some comfortable feeders for birds to install in your yard. Iron cages can be heavy, especially if you opt for breeding or double ones. This is why wheels are important on such a construction if you want to be able to move the cage without hurting your back. What we like about big bird cages for finches is that they also come with an underneath tray that is perfect for storing food supplies, blankets, toys, and others. The size of the door is also important if you like to pet your birds or need to change their food and water supplies regularly. Also, a large door allows you to add fun and challenging bird toys for your pets to keep them occupied all day long.